The use of ultrasonography for CV access was first described in 1978;  Doppler localization was used to mark the skin overlying the IJV. 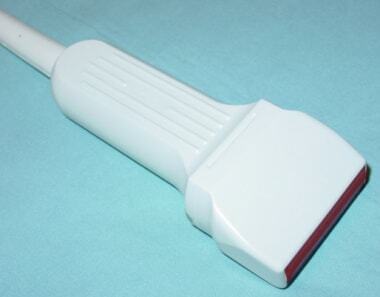 Not until 1986 was the use of real-time ultrasonographic guidance for IJV cannulation reported. In 2001, an Agency for Healthcare Research and Quality Evidence Report listed bedside ultrasonography during CV access as one of 11 practices with "strength of evidence for supporting more widespread implementation." In the 2008 Emergency Ultrasound Guidelines from the American College of Emergency Physicians (ACEP), ultrasonographic guidance for CV access was listed as a "core or primary emergency ultrasound application." In 2010, Ortega et al elaborated the methodology to employ ultrasonography for locating the IJV, underlining the safety and reliability of the technique. The authors also detailed the intraoperative use of sterile ultrasonography. Check the equipment and its function during preparation. Optimize the B-mode picture of the target vessel. Optimize positioning of the patient (eg, Trendelenburg position), of the examiner, and of the US device relative to the puncture site (aim for a comfortable working environment for the interventionalist). Choose the most appropriate head position in order to locate the target vein laterally rather than anterior to the artery. Skills training on appropriate phantoms and in normal patient conditions prior to emergency situations. In hypovolemic patients, give intravenous fluid before puncture. The indication for central lines must be well considered—sometimes peripheral vascular access meets the needs of the condition. The use of ultrasonographic guidance during CV line placement has been demonstrated to significantly decrease the failure rate, complication rate, and number of attempts required for successful access. [12, 13, 14, 15] A recent randomized, multicenter trial using point-of-care limited ultrasonography assistance of CV cannulation reported that ultrasonographic guidance had an odds improvement of 53.5 (6.6-440) times higher than landmark-based technique for success of cannulation. The average number of attempts and the average time to cannula placement were also significantly lower in the ultrasonographically guided group. Other peripheral sites are unavailable or inaccessible. A large-bore venous catheter is needed for rapid administration of fluid or blood products in emergent situations. A CV catheter is needed for the infusion of vasopressors, sclerosing agents, or hyperalimentation fluids with less risk to the vein. CV access is needed for placement of a pulmonary artery catheter or transvenous pacemaker or for performance of hemodialysis or plasmapheresis. CV access is needed for continuous CV pressure and CV oxygen saturation monitoring during resuscitation. Alternative use of the curvilinear probe has been described, but its usage is limited by its large footprint and the lower-resolution images yielded by lower frequencies. A sterile barrier is necessary for use during real-time, dynamic visualization. Sterile transducer covers are commercially available, although sterile gloves can also be used as a barrier. The use of mechanical guides has been described, though experienced operators may not need to use them. Mechanical guides come in 2 forms: built-in needle slot on the transducer and guides that may be fitted onto the transducer. A commercially available central venous guidewire catheter kit or catheter-over-needle device is also required. The kit typically contains a triple lumen catheter, a vessel dilator, a spring guidewire with insertion device, a thin-walled percutaneous entry needle, various gauge needles, various syringes, sterile drapes, No. 11 blade scalpel, lidocaine, and silk suture. For femoral vein access, the patient should be placed in a neutral position. For operator-assisted IJV ultrasonographic guidance, the operator should stand on the ipsilateral side of the patient. The procedure should be performed from the head of the bed and the indicator of the probe should be kept pointing to the operator's left (this corresponds to the left side of the patient's body and is opposite of our traditional orientation). For cannulation of the right IJV, this probe orientation ensures that the vessel positions in the patient's neck (carotid to left, IJV to right) share the same orientation on the ultrasound display. The operator should have a clear view of the ultrasound image. Begin the procedure with hand-washing and universal precautions, including sterile gloves, gown, mask, cap, and protective eyewear. Cleanse the patient’s skin with an antiseptic such as a povidone iodine solution, chlorhexidine gluconate, hexachlorophene, or a combination of these. Vascular cannulation may be accomplished with a catheter-over-needle device or the catheter-over-guidewire technique, which is more commonly known as the Seldinger technique. The vessel to be cannulated may be located with ultrasonography via several accepted variations, including the dynamic (real-time) method and the static (indirect) method, both of which are described below. The dynamic method, shown below, is typically performed by a single operator, although it can also be performed with the aid of an assistant. A sterile sheath, commercially available, or glove with transmission gel (any sterile gel/lubricant may be used) inside should be unrolled over the ultrasound probe. Additional sterile transmission gel is then placed on the outside of the probe cover. 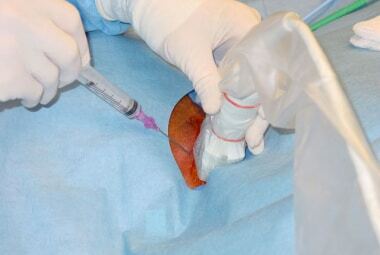 The probe is then placed on the patient's skin and the target vessel is identified. The vein is identified with several techniques, including phasic respiratory pulsations, ease of compressibility, and increased filling using the Valsalva maneuver. The vein to be cannulated should be centered on the ultrasound screen. Once the anticipated path of the needle is identified, the path can be anesthetized with lidocaine under ultrasonographic guidance. This anesthesia minimizes patient discomfort. Next, the skin is punctured with a thin-walled percutaneous entry needle. Do not focus on the ultrasound monitor until the needle has entered into the skin. Focusing on the monitor prior to needle entry can lead to inadvertent needle sticks. Visual focus is then directed to the ultrasound monitor, where the needle appears sonographically as an echogenic line with reverberation or ring-down artifact. Often, the needle is not directly visualized; however, tenting of each tissue plane can be appreciated. See the image below. 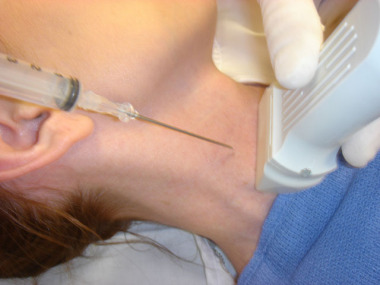 Dynamic ultrasonography demonstrating the needle passing into the internal jugular vein. Note the presence of the reverberation or ring-down artifact posterior to the needle tip. In the short-axis view, scan back and forth with the probe over the needle to locate the needle tip. Often, a longitudinal view can help localize the needle tip. After the needle is seen puncturing the vessel and a flash of blood is seen in the syringe, the ultrasound transducer may be set aside. The remainder of the procedure can be completed without ultrasonographic guidance. Visualization of the guidewire using the longitudinal view within the target central vein verifies intravenous placement. This view minimizes the risk of puncture of the posterior vessel wall. In the event that the location of the wire cannot be verified (eg, in cases in which back-wall puncture of the vessel is suspected), the guidewire can be partially withdrawn and the curvature of the distal "J" portion of the guidewire can be visualized within the target vessel. After needle puncture of the vessel and guidewire placement, the entry needle is withdrawn, and the puncture site is enlarged with a No. 11 scalpel blade. A dilator may then be used to facilitate placement of the catheter. Venous blood return and easy flushing suggest accurate placement. Ultrasonography can also visualize the catheter and its relative location to the vein. After the catheter is in place, it is secured with either simple interrupted sutures or staples. If cannulation is unsuccessful, chest radiographs must be obtained before repeat attempts on the contralateral side to rule out complications. The indirect method (see the image below) involves the least amount of ultrasonographic guidance. Static (indirect) method, showing course of right internal jugular vein identified by ultrasonography. The vessel is identified and centered on the ultrasound screen. A temporary mark is then placed on the skin to indicate where the needle is to be inserted. This mark can be made by indentation or with a sterile marker. A second mark is then placed distal to this mark along the course of the vessel to use as a guide to direct the path of the needle. In the short-axis, or transverse, approach, shown below, the vessel is centered under the transducer. The needle is then inserted at a 45° angle, using the midpoint of the transducer as a reference site. In the long-axis, or longitudinal, approach, shown below, the greatest anterior-posterior diameter of the target vessel is visualized. The needle is then inserted at a 30° angle along the axis of the transducer. Catheter visualized within internal jugular vein, seen in long-axis (longitudinal) view. The "ski lift" approach to ultrasound-guided vascular access has been suggested to improve successful line placement. The authors use the long-axis view to visualize the entire needle and vessel concurrently, which is purported to minimize puncture of the posterior wall, in addition to facilitating placement. The short-axis approach is useful for concomitant visualization and avoidance of the adjacent arteries, for cannulation of smaller peripheral veins, and when space is limited (eg, when cannulating the IJV). The long-axis approach enables better visualization of the advancing needle, threading of the guidewire, and avoidance of inadvertent puncture of the posterior vessel wall. 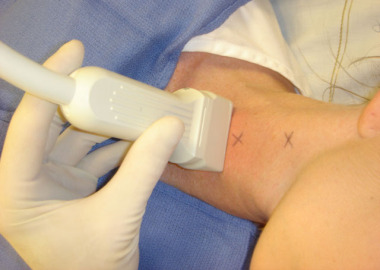 Insertion of the needle containing the tip of the guidewire is performed using the long-axis technique under dynamic ultrasound guidance. After the tip of the needle is seen entering the vessel, the wire is subsequently advanced into the vessel. Several advantages to this technique include eliminating the risk of dislodging the needle tip when the syringe is removed from the needle as in the classic Seldinger technique, as well as increased echogenicity of the needle containing the wire on ultrasound imaging. 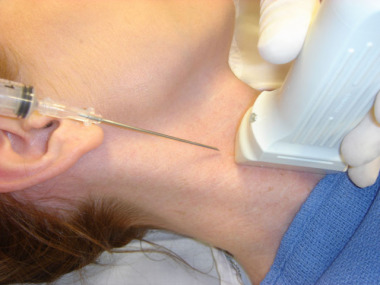 One potential complication of this technique is misidentification of the target vessel, resulting in inadvertent cannulation of the carotid artery, for example. Ultrasonographic guidance of FV cannulation during CPR has demonstrated that chest compressions are associated with changes in venous diameter. When using the landmark-based approach for FV cannulation during CPR, needle insertion medial to the arterial pulsation may be misleading. Ultrasonographic guidance may also be used for peripheral venous cannulation in patients who need intravenous access but have no visible or palpable veins. The most serious and most common complications include pneumothorax, arterial puncture and cannulation, and local infection. Potential complications during anesthesia administration include inadvertent venous or arterial infusion of lidocaine with or without epinephrine or subcutaneous air instillation that obstructs view during ultrasonographic guidance. Consent should be obtained from the patient or family member, unless emergent circumstances otherwise dictate. The reason the procedure is being performed (suspected diagnosis); the risks, benefits, and alternatives of the procedure; the risks and benefits of the alternative procedure; and the risks and benefits of not undergoing the procedure. Allow the patient the opportunity to ask any questions and address any concerns they may have. Make sure that they have an understanding about the procedure so they can make an informed decision. The patient should be counseled about the risks of allergic reaction to the local anesthesia, vascular injury (air embolus, damage to adjacent vessels, pericardial tamponade, catheter embolus, arteriovenous fistula, mural thrombus formation, hematoma), infection (localized cellulitis, generalized sepsis, osteomyelitis), dysrhythmias, catheter malposition. For the subclavian and internal jugular approaches, counsel the patient about the risk of pneumothorax, hemothorax, chylothorax, hemomediastium, neck hematoma and tracheal obstruction, tracheal perforation, phrenic nerve injury, brachial plexus injury, and cerebral infarct. For the femoral approach, counsel the patient about the risk of psoas abscess, bladder perforation, and femoral artery injury. Reassure the patient that the use of the ultrasound will help reduce many of these risks and help guide the physician in locating the correct vessel. The patient should also be counseled that even if there are no complications, the procedure may not be successful and that a diagnosis still may not be obtained from the procedure. Discuss with the patient the possibility that the catheter may be placed in the wrong position and may need to be repositioned. Also instruct them that it is possible that the procedure may need to be repeated. Discuss how these risks can be avoided or prevented (eg, use of the ultrasound, proper positioning, ensuring that the patient remains as still as possible during the procedure, adequate analgesia). Lidocaine with or without epinephrine may be infiltrated locally under ultrasonographic guidance. For more information, see Local Anesthetic Agents, Infiltrative Administration. Instillation of anesthetic with ultrasonographic guidance allows for more precise placement and improved analgesia. Inadvertent air instillation in the overlying tissues is important to avoid, as it may cause a reverberation or free air artifact that obscures the ultrasound image. Batllori M, Urra M, Uriarte E, Romero C, Pueyo J, López-Olaondo L, et al. Randomized comparison of three transducer orientation approaches for ultrasound guided internal jugular venous cannulation. Br J Anaesth. 2016 Mar. 116 (3):370-6. [Medline]. Maecken T, Heite L, Wolf B, Zahn PK, Litz RJ. Ultrasound-guided catheterisation of the subclavian vein: freehand vs needle-guided technique. Anaesthesia. 2015 Nov. 70 (11):1242-9. [Medline]. Sznajder JI, Zveibil FR, Bitterman H, Weiner P, Bursztein S. Central vein catheterization. Failure and complication rates by three percutaneous approaches. Arch Intern Med. 1986 Feb. 146(2):259-61. [Medline]. Jastremski MS, Matthias HD, Randell PA. Femoral venous catheterization during cardiopulmonary resuscitation: a critical appraisal. J Emerg Med. 1984. 1(5):387-91. [Medline]. Ullman JI, Stoelting RK. Internal jugular vein location with the ultrasound Doppler blood flow detector. Anesth Analg. 1978 Jan-Feb. 57(1):118. [Medline]. Yonei A, Nonoue T, Sari A. Real-time ultrasonic guidance for percutaneous puncture of the internal jugular vein. Anesthesiology. 1986 Jun. 64(6):830-1. [Medline]. Rothschild JM. Ultrasound guidance of central vein catheterization. In: Making health care safer: A critical analysis of patient safety practices. Agency for Healthcare Research and Quality. Available at http://www.ahrq.gov/clinic/ptsafety/chap21.htm. Accessed: September 6, 2006. Ortega R, Song M, Hansen CJ, Barash P. Videos in clinical medicine. Ultrasound-guided internal jugular vein cannulation. N Engl J Med. 2010 Apr 22. 362(16):e57. [Medline]. Jenssen C, Brkljacic B, Hocke M, Ignee A, Piscaglia F, Radzina M, et al. EFSUMB Guidelines on Interventional Ultrasound (INVUS), Part VI - Ultrasound-Guided Vascular Interventions. Ultraschall Med. 2016 Oct. 37 (5):473-476. [Medline]. Dietrich CF, Horn R, Morf S, Chiorean L, Dong Y, Cui XW, et al. Ultrasound-guided central vascular interventions, comments on the European Federation of Societies for Ultrasound in Medicine and Biology guidelines on interventional ultrasound. J Thorac Dis. 2016 Sep. 8 (9):E851-E868. [Medline]. Abboud PA, Kendall JL. Ultrasound guidance for vascular access. Emerg Med Clin North Am. 2004 Aug. 22(3):749-73. [Medline]. Denys BG, Uretsky BF, Reddy PS. Ultrasound-assisted cannulation of the internal jugular vein. A prospective comparison to the external landmark-guided technique. Circulation. 1993 May. 87(5):1557-62. [Medline]. Verghese ST, McGill WA, Patel RI, Sell JE, Midgley FM, Ruttimann UE. Ultrasound-guided internal jugular venous cannulation in infants: a prospective comparison with the traditional palpation method. Anesthesiology. 1999 Jul. 91(1):71-7. [Medline]. Hunter M. Peripherally inserted central catheter placement @ the speed of sound. Nutr Clin Pract. 2007 Aug. 22(4):406-11. [Medline]. Milling TJ Jr, Rose J, Briggs WM, Birkhahn R, Gaeta TJ, Bove JJ. Randomized, controlled clinical trial of point-of-care limited ultrasonography assistance of central venous cannulation: the Third Sonography Outcomes Assessment Program (SOAP-3) Trial. Crit Care Med. 2005 Aug. 33(8):1764-9. [Medline]. Maecken T, Grau T. Ultrasound imaging in vascular access. Crit Care Med. 2007 May. 35(5 Suppl):S178-85. [Medline]. Feller-Kopman D. Ultrasound-guided internal jugular access: a proposed standardized approach and implications for training and practice. Chest. 2007 Jul. 132(1):302-9. [Medline]. Skippen P, Kissoon N. Ultrasound guidance for central vascular access in the pediatric emergency department. Pediatr Emerg Care. 2007 Mar. 23(3):203-7. [Medline]. Beaudoin FL, Merchant RC, Lincoln J, Gardiner F, Liebmann O, Cohn J. Bedside ultrasonography detects significant femoral vessel overlap: implications for central venous cannulation. CJEM. 2011 Jul. 13(4):245-50. [Medline]. Powell JT, Mink JT, Nomura JT, Levine BJ, Jasani N, Nichols WL, et al. Ultrasound-Guidance Can Reduce Adverse Events During Femoral Central Venous Cannulation. J Emerg Med. 2014 Jan 21. [Medline]. Theodoro D, Bausano B, Lewis L, Evanoff B, Kollef M. A descriptive comparison of ultrasound-guided central venous cannulation of the internal jugular vein to landmark-based subclavian vein cannulation. Acad Emerg Med. 2010 Apr. 17(4):416-22. [Medline]. Sommerkamp SK, Romaniuk VM, Witting MD, Ford DR, Allison MG, Euerle BD. A comparison of longitudinal and transverse approaches to ultrasound-guided axillary vein cannulation. Am J Emerg Med. 2013 Mar. 31(3):478-81. [Medline]. Hind D, Calvert N, McWilliams R, Davidson A, Paisley S, Beverley C. Ultrasonic locating devices for central venous cannulation: meta-analysis. BMJ. 2003 Aug 16. 327(7411):361. [Medline]. Phelan MP. A novel use of the endocavity (transvaginal) ultrasound probe: central venous access in the ED. Am J Emerg Med. 2003 May. 21(3):220-2. [Medline]. Shojania KG, Duncan BW, McDonald KM, Wachter RM, Markowitz AJ. Making health care safer: a critical analysis of patient safety practices. Evid Rep Technol Assess (Summ). 2001. (43):i-x, 1-668. [Medline]. Lamperti M, Subert M, Cortellazzi P, Vailati D, Borrelli P, Montomoli C, et al. Is a neutral head position safer than 45-degree neck rotation during ultrasound-guided internal jugular vein cannulation? Results of a randomized controlled clinical trial. Anesth Analg. 2012 Apr. 114(4):777-84. [Medline]. Lichtenstein D, Mezière G, Biderman P, Gepner A. The "lung point": an ultrasound sign specific to pneumothorax. Intensive Care Med. 2000 Oct. 26(10):1434-40. [Medline]. Schofer JM, Nomura JT, Bauman MJ, Hyde R, Schmier C. The "Ski Lift": A Technique to Maximize Needle Visualization with the Long-axis Approach for Ultrasound-guided Vascular Access. Acad Emerg Med. Jul 2010. 17(7):e83-e84. Stone MB, Mallin M, Cook J. Another WIN for point-of-care ultrasound: the wire-in-needle modified Seldinger technique for ultrasound-guided central venous access. Acad Emerg Med. 2013 Jun. 20(6):E14-5. [Medline]. Hilty WM, Hudson PA, Levitt MA, Hall JB. Real-time ultrasound-guided femoral vein catheterization during cardiopulmonary resuscitation. Ann Emerg Med. 1997 Mar. 29(3):331-6; discussion 337. [Medline]. Bergin D, Pappas JN, Hwang JJ, Sheafor DH, Paulson EK. Echogenic polymer coating: does it improve needle visualization in sonographically guided biopsy?. AJR Am J Roentgenol. 2002 May. 178(5):1188-90. [Medline]. Merrer J, De Jonghe B, Golliot F, Lefrant JY, Raffy B, Barre E. Complications of femoral and subclavian venous catheterization in critically ill patients: a randomized controlled trial. JAMA. 2001 Aug 8. 286(6):700-7. [Medline]. Sekiguchi H, Tokita JE, Minami T, Eisen LA, Mayo PH, Narasimhan M. A prerotational, simulation-based workshop improves the safety of central venous catheter insertion: results of a successful internal medicine house staff training program. Chest. 2011 Sep. 140(3):652-8. [Medline]. Normal anatomy of the internal jugular vein and carotid artery. Note the compressibility of the internal jugular vein. Special thanks to the emergency medicine residents and faculty of the UAB Department of Emergency Medicine. Working for a Remote Intensive Care Unit: How Does It Differ?